WASHINGTON – The Defense Department moved Wednesday to clarify comments Secretary Jim Mattis made a day earlier about joint military exercises with South Korea in an effort to avoid any misinterpretation that could jeopardize disarmament talks with North Korea. The United States suspended three military exercises with South Korea after President Trump met North Korean leader Kim Jong Un in Singapore in June to give diplomats space to continue negotiations, the Pentagon said in a statement attributed to Mattis. The clarification comes a day after Mattis said at a Pentagon news conference that the U.S. military had “no plans at this time to suspend any more exercises.” “We turned off several 1/8exercises 3/8 to make a good-faith effort. We are going to see how the negotiations go, and then we’ll calculate the future, how we go forward,” he added. 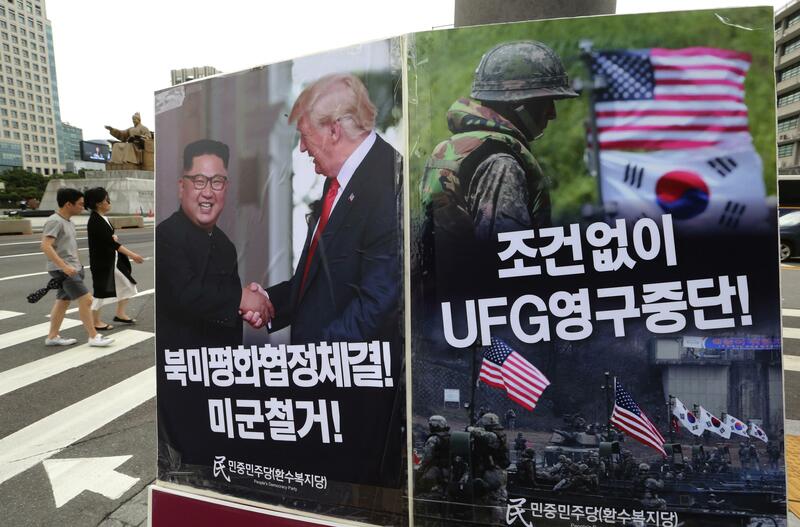 Some interpreted those comments as an announcement that the Pentagon was ending an open-ended suspension of exercises with South Korea and an indication of a further breakdown in talks between Washington and Pyongyang. Wednesday’s statement marked the Pentagon’s effort to dispel that perception. Only three individual military exercises with South Korea had been shelved, the statement pointed out, not all military exercises indefinitely. Other planned exercises between the United States and South Korea hadn’t been affected by the decisions made at the summit. “Our forces maintain a high state of military readiness and vigilance in full support of a diplomatically-led effort to bring peace, prosperity and stability to the Korean peninsula,” the statement released Wednesday added. The statement comes at a particularly tense moment in relations with North Korea. Last week, the Trump administration canceled what would have been Secretary of State Mike Pompeo’s fourth trip to Pyongyang for nuclear talks, as the president grows frustrated over stalled negotiations. Trump said on Twitter he had instructed Pompeo not to go because there had not been “sufficient progress with respect to the denuclearization of the Korean Peninsula.” Trump said Pompeo is looking forward to going to North Korea in the near future, most likely after the United States and China resolved trade issues. North Korea has demanded the United States declare a formal end to the Korean War, but American diplomats want Kim’s government to offer up some concessions on denuclearization before Washington takes that step. U.S. officials have said North Korea’s nuclear weapons and missile programs are still progressing clandestinely, even though the nation announced it was dismantling certain facilities and suspending missile tests. Military exercises between the United States and South Korea have long been a sore point for North Korea, which often describes them as provocations and in the past has responded to them aggressively. In response to a military exercise in late 2010, North Korea shelled a South Korean island resulting in one of the most tense incidents on the peninsula since the 1953 armistice. Published: Aug. 29, 2018, 7 p.m.